Doing 6-gaps last year on Saturday of Memorial weekend worked so well that we decided to do it same day again. There seemed to be minimal traffic, and the risk of dangerously hot weather is pretty low. But we lucked out on the hot weather aspect. Temp was in the 90’s the day before. As a group we didn’t have any time goals this year. The three riders new to 6-gaps this year wanted to complete all six gaps. We stayed together as a group up to the last gap, indicating a strong group of similar fitness riders. We started from our usual spot at the junction of Rts 73 and 100 just south of Rochester. No knee warmers or long sleeves needed at 9am. It was already 70 degrees and sunny. We eased into Brandon gap, the easiest climb of the six. Dave Penney picked it up as it got steeper and crested ahead of the rest of us, a pattern he repeated on every gap. On the way up, we startled a bull moose just off the road. Scared the crap out of me too as the moose crashed through the woods. Tim Ahern, the biggest rider of the group and new to 6-gaps rode conservatively to make sure he wouldn’t blow up on Lincoln or App Gaps. On the Brandon descent, Kevin Ruffer had a near catastrophe. His new (to him) Cannondale started to go unstable on the fastest part of the descent. A rear wheel skid sent him off the pavement, but amazingly Kevin stayed upright and did not go down. My aluminum Specialized has done this to me twice, and it is a wicked scary thing when it happens. Just have to not panic, squeeze top tube with knees, and stiffen hold on bar. Oscillations will dampen out quickly. Idea is to tightly couple your body mass to bike and its control components. Middlebury Gap gets a bit more serious. Again, Dave set the pace, with Todd Brown and me following. The others crested shortly afterwards. The Middlebury descent is open with sweeping turns. I think most riders held speeds near to just over 50mph on stretches of this. Tim hit 52.4mph. We had some tail wind too, as the wind seemed to be out of NW. We refueled in Hancock before heading up Rt 100 to Lincoln Gap. Pre-ride group photo with Doug, Kevin R, Todd, Kevin B, Dave, Ryan, and Tim. Glen took the photo. New blacktop beginning first climb up Rt 73 to Brandon Gap. recent rain, things were fabulously green. This is Vermont in spring. 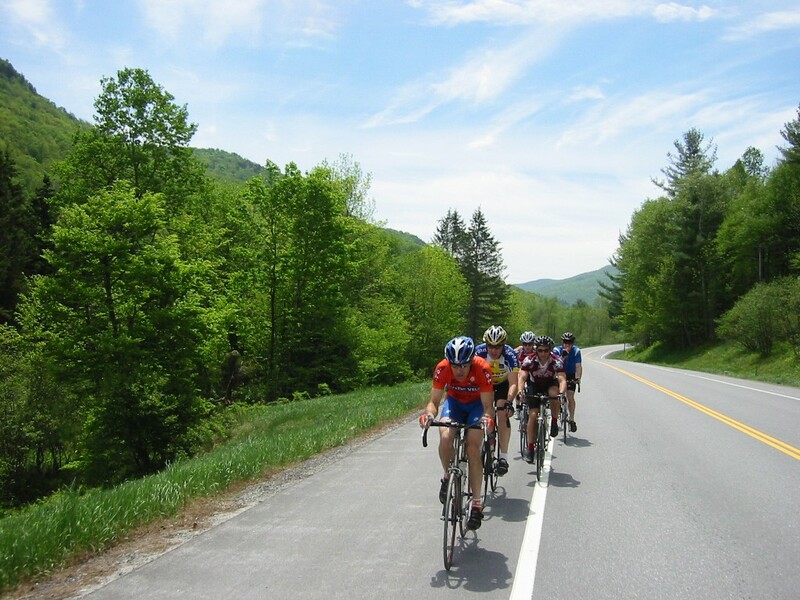 Lincoln Gap is the most feared climb in New England cycling. It doesn’t matter how low you gear your bike. It is so steep that just to go fast enough to not fall over takes everything you’ve got. It peaks out at 24% grade for a lengthy distance, and an average sized rider can expect to put out over 350W for upwards of 15 minutes to avoid walking. Most of us made it without walking, and some of the riders were pushing pretty big gears. Ryan Larocque was pushing a 36x27 I believe. He passed me on the way up. He commented he had to go that fast because he had such big gears. I was struggling in my 34x32. Tim, the biggest rider known to finish 6-gaps, resorted to walking the upper portion. I think Tim was using a compact 34x27 setup, and he is a lean 215lbs at 6’-4”. Another big rider to do 6-gaps the two prior years (Jason Holden) had to walk too, and he used a triple. While big riders can generate much higher absolute power than average size riders, they fall short in terms of Watts/Kilogram. And it is W/kg that gets you up something steep like Lincoln Gap. We were all relieved Lincoln Gap was over, and we were all still in pretty good shape. 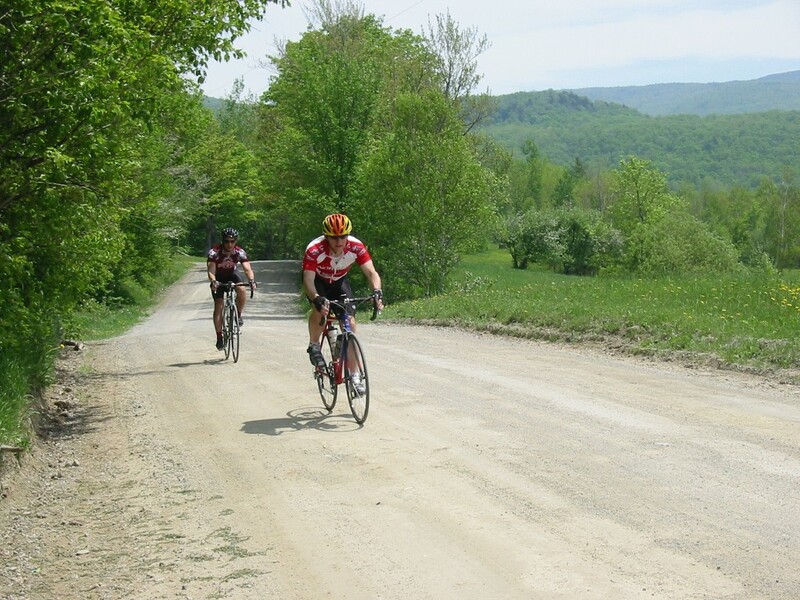 The Lincoln descent is always pretty rough, and the paved portion continues to degrade each year. The gravel was quite a bit looser in spots this year too. No 40mph bombing this descent! We refueled again at the Lincoln general store. I had a deli egg salad sandwich, which was very yummy. Tim Ahern finishing Lincoln Gap with shoes in hand. It is way too steep to walk in cleated cycling shoes. 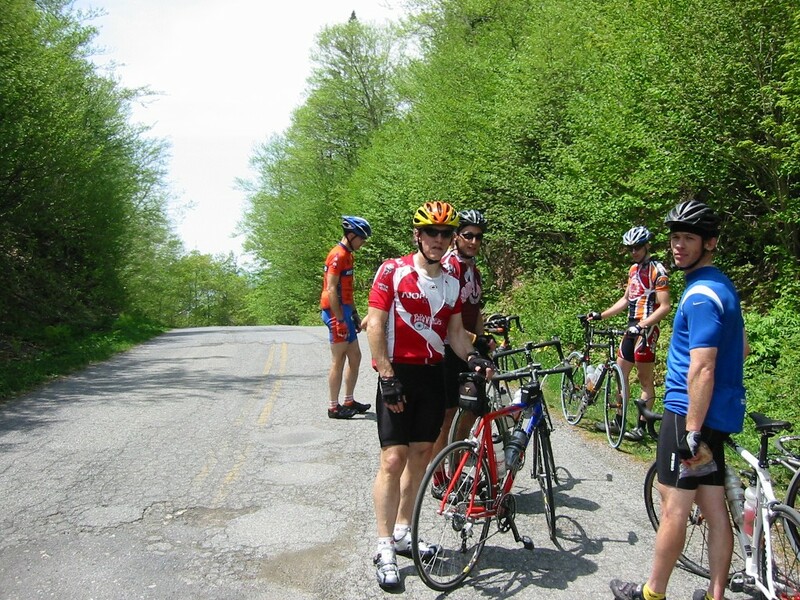 Left to right at Lincoln Gap: Todd, Glen, Kevin Ruffer, Ryan, and Dave. Glen Fraser and Kevin Ruffer finishing dirt portion of Lincoln Gap descent. Beginning the initial climb up Appalachian Gap on a bump often referred to baby gap, the hard efforts on the first three gaps where really setting in. My legs didn’t want to go. Dave pulled well ahead on the upper portion of App Gap. We were riding with a tail wind, and parts of the climb are sheltered and in full sun. It was a very warm climb. There was a strong breeze blowing through the gap, and the weather felt just perfect at the top. We waited a while for the last rider to crest this one, and then began the risky descent to Waitsfield. 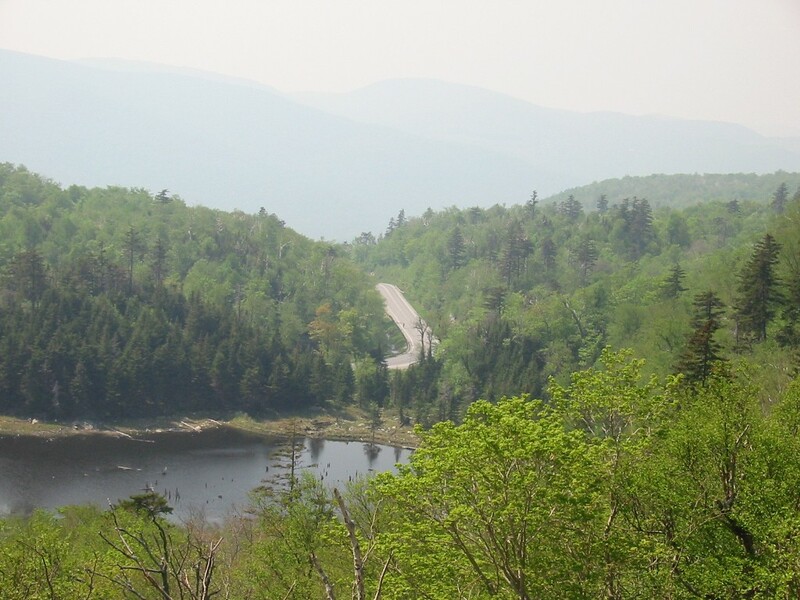 There are a few sharp curves where the road curves gently around the mountain, but then just out of sight it curves abruptly back the other way with a guardrail on the outside. I had heard three riders were seriously hurt going into this guardrail after the Green Mountain Stage Race prologue last year. We all had ample warning. At the bottom of App Gap, we filled up with fluids again, but my stomach was not going to take much more of the simple carb stuff we’re stuck with when buying supplies on the ride. I ate just a small granola bar, had 1/3 cup of coffee, and put some more dilute Gatorade in my bottles with a couple more electrolyte capsules. Look closely, Tim coming up App Gap just before coming around pond into finishing 1km of 18% grade. We roll off from Waitsfield to Warren to hit Roxbury Gap next with our entire group still intact. Roxbury hurt all of us pretty good. It gets steep and stays that way to the top, plus you are riding on dirt most of the time. The gravel was in very good shape though, making the climb and descent quite enjoyable. Dave crested the peak at least a few minutes ahead of me. We chose not to regroup at the top of this one, instead regrouping in Roxbury at the bottom. I caught back up to Dave on the descent, and we waited a few minutes for the next rider to come down. We did not have to wait long for the rest to show. We made our last fuel stop right there at the bottom of Roxbury Gap with about 30 miles and one climb to go. I had small ice-cream sandwich and added more dilute Gatorade to my bottles. This was first year doing 6-gaps with bottles instead of Camelbak. I do not regret it. Camelbaks are convenient in that they hold lots of stuff, can go twice as long without a refill, and are easier to drink from. But they are warm, and when doing steep climbing ride like this with lots of out of saddle mashing, that is added weight to your legs. I used small borrowed saddle bag (I don’t own one) and fanny pack to hold my other gear. After a bit of disorganization, we got a really nice paceline going on Rt 12a. This heads south, and we had predominantly tail wind. My computer died between lunch ride on Friday and 9am on Saturday, so I could not tell how fast we were going. Tim commented later that we were going 28-31mph most of the time on this section, and we really did not have to work at. Just after passing through Bethel, Glen flats. He nailed a large rock. I pulled pack to help while the others continued ahead. We thought they were just going to finish the ride since there was only 10-15 miles to go. We quickly put new tube in and worked hard to reach Camp Brook Rd, the road up and over Rochester Gap. But the others were waiting for us at the turn off. So once again we were all together. Kevin Buckley started a little ahead of the rest of us. It took Dave, Ryan and I a while to catch and eventually pass Kevin. 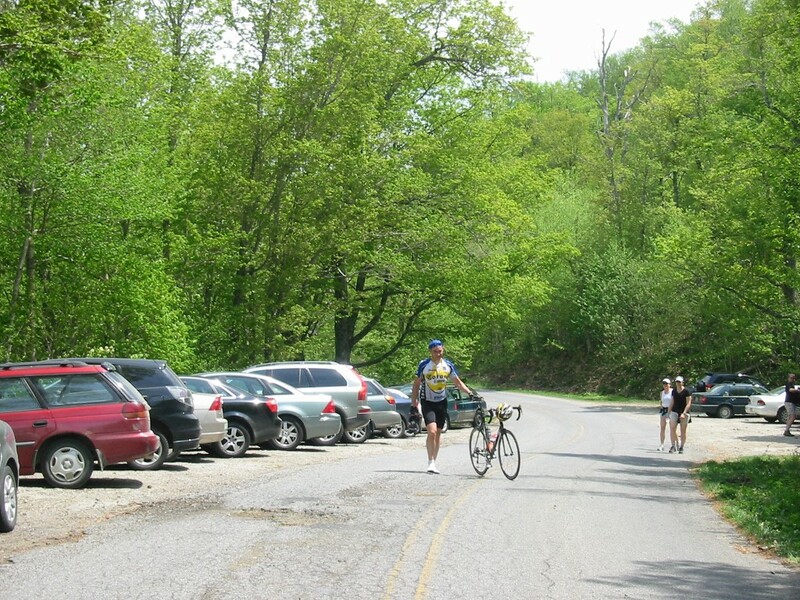 This climb starts modest, but gets steeper and steeper as you gain altitude. Most riders are completely spent by this point. There are a couple places on Rochester Gap where you round a corner, and you see these friggin walls in front of you. Makes you want to cuss. Todd said he was cussing on this climb. Anyway, I thought I was going to stay with Dave for once, but he just rolled away when it got steep again, cresting 1-2 minutes ahead of me. Dave just puts it in a big gear (big for me), stands, mashes, and rolls away. Dave coasted over the top, and I quickly caught him beginning the descent. The one good thing for me this year is I experienced zero cramping during and after the ride. I always seem to experience cramping by the end of the ride or changing my clothes after the ride. I probably used the equivalent of 8 Endurolyte capsules in my fluids this year. It felt so good to roll back into Rochester. I quickly stripped down to shorts and dipped into the stream at the cars to get 132 miles and 14,000 feet of grit and salt off my body. Riders came straggling in after this climb. But Kevin Buckley, who was in middle of pack cresting the mountain, did not show up. This had us all worried, since he should have finished ahead of others, but those guys did not see him. He drove in with Ryan, so Ryan headed out to find him. Problem was, there is no cell phone coverage in Rochester. Ryan left his number anyway in case Kevin showed up. Dave, Glen and I went to general store in Rochester to find sandwiches and ice-cream, and Kevin showed up. He had turned right when reaching town, then not thinking that was right way to go, went part way back up the gap looking for turn he thought he missed, but came back down again and found us. We left Ryan a message from land line at store, and fortunately he picked up coverage up high somewhere. Last year too, we had two riders make the same wrong turn as Kevin. Kevin commented he really didn’t need the extra six miles, presumably with some climbing involved too. This was one of the most successful 6-gaps rides yet. Perfect day, no catastrophes, the group completed the ride together, and fun was had by all (in a sadistic hillclimber’s sense). It was my fifth attempt, fourth complete 6-gaps ride. Glen is one less than me. Dave, Kevin Buckley, and Ryan have completed 6-gaps twice now. Todd, Tim, and Kevin Ruffer completed their first 6-gaps ride with total success. Todd’s computer showed 7:35 riding time. The others showed 7:50 or less. I was at least a few minutes faster than Todd, and Dave several minutes faster than me. That would put my riding time around 7:30, and Dave in the 7:20-7:25 range, which are new PRs for both of us. I wish my computer hadn’t died. The mileages ranged from 131 to 133, again showing the ride is about 132 miles in length. One rider with a barometric altimeter had 11,700ft I believe. These always read low, as small rolling hills don’t register. I’ve seen altimeter readings range from 11,100 to over 12,000ft for this ride. 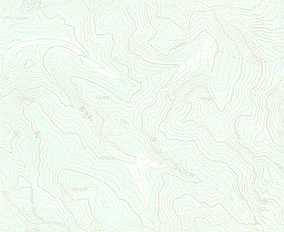 Topo gives over 15,000ft, but I know that is too high. Truth lies in between. Bottom line is it doesn’t really mater. This ride is hard no matter how you chose to measure it.